Do kids need fancy toys? 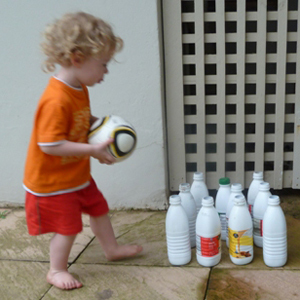 This mom extols the virtues of the humble milk bottle. My kids have been given tons of fantastic toys from adoring family and friends. They have things that beep and flash and move and sing and do everything but change their nappies (now there’s a toy I’d buy!). But my kids frequently remind me that toys are nice little luxuries – NOT necessities as the manufacturers would have you believe. Are toys necessary for development? Being no brain surgeon myself (and, incidentally, having had plenty of interesting toys as a child), I cannot corroborate these claims. It makes sense to me that babies need to explore the world and learn about it by stimulating their senses. But I don’t believe that toy manufacturers have the monopoly on the tools with which to do this. My boys love empty plastic milk bottles. I mean adore them. My 8-month-old chews on the open end to soothe his teething gums, and loves the feel of the ribbed sides under his stubby little fingers. He enjoys making different noises by banging the hollow bottle on the floor, Bumbo, Mommy’s leg, or whatever is in reach. For the record, the lid is far too large to pose a choking risk, but they usually disappear anyway. My 2-year-old also loves banging the empty bottles on things (the louder the better!). Meanwhile, he has also progressed to using them as containers for sand and water – countless hours of pouring and scooping and measuring and learning. He uses them for pretend play: ‘Look, I baking, Mommy! Is milk, Mommy! I make tea!’ He develops fine motor skills by putting the lid on and off and on and off and on and off (before eventually losing it – or maybe burying it – somewhere in the sandpit). He even uses them for skittles with his soccer ball, developing gross motor skills. When they’re older, milk bottles will probably become the focus of arts and crafts projects (think painted as vases or filled with sand as doorstops), or science experiments like filling a range with different levels of water and blowing them like an organ. The obvious parental perks of this favourite toy are that milk bottles are virtually free and readily available – and that when they do get a bit grotty or deteriorate from being left in the sandpit for too long, we simply recycle them. Can toys actually interfere with development? What do your children play with?